The Newcastle Knights are an Australian professional rugby league football club based in Newcastle, New South Wales. They compete in Australasia's premier rugby league competition, the National Rugby League (NRL) premiership. 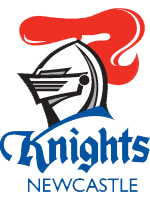 Playing in red and blue, the Knights joined the top tier competition in 1988, 79 years after the previous Newcastle based team, the Newcastle Rebels had departed the Sydney competition with the formation of a separate league competition based in the Newcastle region. The club has won two premierships over its history (1997 and 2001) and produced such players as Andrew Johns. Their home ground is Ausgrid Stadium. 2008 was a resurgence year for the Knights. They were unlucky to miss out on the finals, going down to the Brisbane Broncos 24-2 in the final round of the competition, which allowed the New Zealand Warriors (who easily overcame the Parramatta Eels) to take 8th place. The Knights started the 2009 season convincingly, they were placed 2nd in the ladder at round 10. During the season the Knights equalled their best home winning streak record with 9 wins, equalling the previous 9 wins recorded in 1995. Towards the end of the season coach Brian Smith announced he was leaving the Knights to join the troubled Sydney Roosters in 2010 after their horrific season. Over the next few weeks assistant coach Rick Stone was announced as the new coach of the Knights. The Knights toward the end of the season lost 3 games in a row, which put them in doubt for the finals, which they had looked like making all year. They then had an outstanding comeback to beat eventual grand finalists, Parramatta up the ladder. They finished the year 7th out of 16 after losing to the Bulldogs in week one of the finals. Rick Stone said he was looking forward to his first off-season in charge. On the 16th, December 2009 it was announced player Danny Wicks was involved in a drug bust involving amphetamines, cocaine and ecstasy. He was stood down. Eventually Wicks terminated his own contract as he didn't want to keep bringing shame the club and sponsors. For the 2010 season the Knights signed McDonalds and Coca-Cola as major sponsors. In March 2010 Chris Houston was served with notice to attend court on charges of supplying ecstasy and cocaine. He was stood down indefinitely. June 2010 capped of a good period for the Knights after they confirmed the signings of 2009 Toyota Cup Player of the Year Beau Henry on a 3-year deal, 2009 Toyota Cup Centre of the Year Siuatonga Likiliki on a 2-year deal and former Australian international prop Antonio Kaufusi on a 2-year deal. In the next few days, the Knights also confirmed the signings of current Queensland Maroons star Neville Costigan on a 3-year deal and promising, young backrower Kyle O'Donnell on a 2-year deal. The Knights finished 11th in the 2010 season. While the club did not play in the finals, Adam MacDougall recorded the most tries for the club and Akuila Uate equalled the most tries in a season marking an otherwise forgetful year for the Knights. In December 2010, former Knight Chris Houston was cleared of all drug charges and re-signed with the club for 2 years.